Create lifelong memories with our festival & cultural tour packages today! festivals in Bhutan which includes pot luck type lunch. Couple with dresses, food are served in traditional bamboo plates called bangchungs. Big festivals in Bhutan like Tshechus are conducted in the dzongs. Dzongs are fortresses built four centuries ago which now houses religious as well as administrative heads. Tshechus are celebrated on the 10th day of a particular month. Festival trips take you to the length and width of festivals in Bhutan. As a matter of fact, different regions have different dates for such Bhutan festivals. 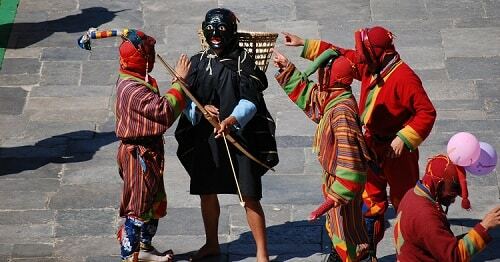 Bhutan Festival tours take you inside festivals in Bhutan and Tshechus. These provide you with a colorful ensemble of art and joy as well as spiritual well being. The festival trips take you around the most prominent Tshechus namely at Thimphu, Paro and Punakha. Bhutan festivals are entwined of spirituality with joyousness. This is the reason you see in these festival tours how dance mixes between the mask dances. 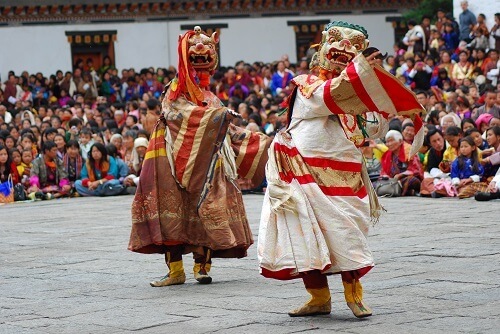 These dances in middle of Tshechus are usually presented in different forms by local villagers and are meant to entertain the audience present for Bhutan festivals. Bhutan is known for its rich cultural heritage which is evident by its religious integration with normal life. Festival trips and festival tours take you to different places and shows how religion has integrated peacefully with life. Tshechus are three days of festivals in Bhutan where there is complete devotion, color and cheer to equally make for a fine Bhutan Festival tour. Watch out for Atsaras (masked Clowns) at the Tshechus. These clowns are mischievous and funny. We hope to bring both colors coupled with spiritual well being to your life with our festival tours.